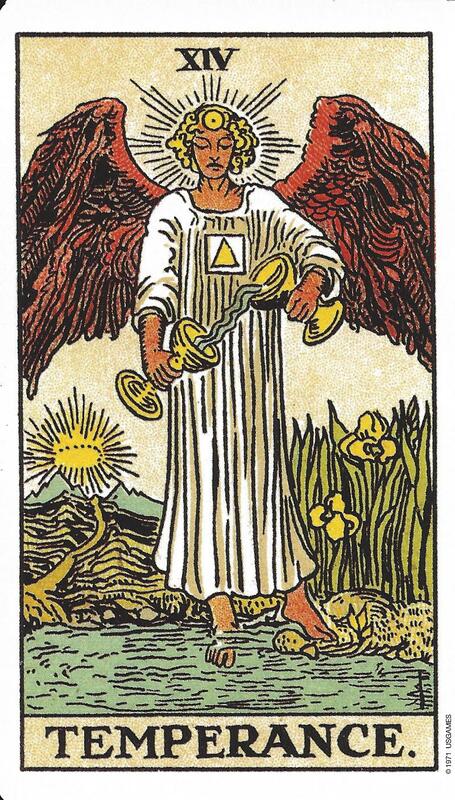 Next, our Dreamer comes to Balance or in the Rider-Waite (RW) tarot the card of Temperance. This is card 14. After the Dreamer releases the old, it is time to consider finding balance. In both cards, you will notice that the angel is mixing something from two cups. The angel is pouring from left to right and right to left. Hot and cold water can be mixed like this to create something temperate. Temperance is about blending two extremes. In RW tarot it is believed that the angel on the card is really a hermaphrodite (blending of male and female). Additionally, in both cards, there is one foot on earth and the other in the water. Earth represents our physical selves and water symbolizes our emotional or inner selves. The two worlds are coming together and the blending is not rushed. This is a time of great patience; a time to think through our options thoroughly as we continue on the path toward enlightenment. 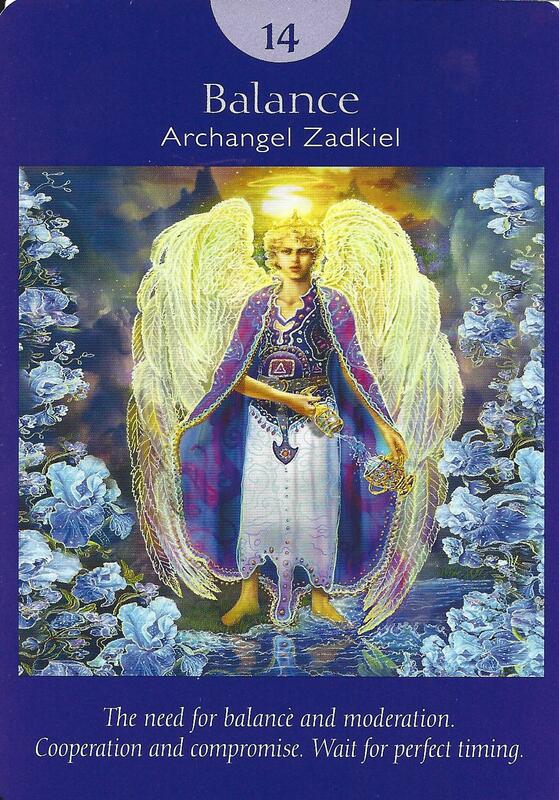 In Angel Tarot, we see Archangel Zadkiel whose name means “the righteousness of God.” Archangel Zadkiel is also known as the students’ angel because he helps with learning. When this card is drawn it means it is time to use caution and slow things down a bit. It is not a time to act impulsively. And if you have in the past acted impulsively, it may mean that you now have an opportunity to reevaluate the situation and change your approach so that you can heal or make things right again. It is a time for compassion and kindness as you work collaboratively with others to manifest your dreams.